Ok, so I got this fabulous tulle skirt from Shabby Apple to wear for the second session of our engagement photos... & because, let's be honest, what girl doesn't want a tulle skirt to prance around in!? amiright? How would you style this skirt?! You should also probably start thinking of how you would style this skirt or some of the beyond adorable vintage dresses from Shabby Apple because one of you lucky ladies is going to win a $50 giftcard to their store!! I image that all of you style-savvy ladies have had Shabby Apple on your radar for some time. But for those of you that haven't, Shabby Apple is an online dress boutique that specializes in vintage & retro dresses, including a totally enviable swim suit collection! While I hope you win, either way, I predict you will be shopping there in no time! Truthfully? I don't like the knotted chambray--your figure is completely hidden by the fabric of the chambray and the skirt. I think what I liked best from our engagement shoot were the simple outfits. (We were outside--I'm guessing you will be as well.) I'd go with a simple tank and a statement necklace in neutral colors. (Like this: http://www.anntaylor.com/ann/product/AT-Weddings-Events/AT-Weddings-View-All/Asymmetrical-Tulle-Skirt/303259?defaultColor=5178&CID=aff_2687457) Or even a navy striped tank---but definitely something more fitted up top. I am with Laura K. Too much fabric around the middle. I think Grace from Stripes & Sequins styled this same skirt with a simple Tshirt tucked in. You are adorable though! I would love to own the Golden Afternoon dress. I love the skirt! I'd probably style it with a fitted polka-dot shirt tucked into the skirt and a statement necklace. And as for the Shabby Apple giveaway, I'd either buy a tulle skirt like yours (I've been eyeing them for a while) or the El Capitan dress. :) Thanks! For some reason, the skirt looks like it's sitting really high up, but I think that's because of the knotted shirt. I agree with the others- go fitted. Maybe a lace shirt? Could you tell me if the giveaway is open to your international followers? I have to agree with Laura , a simple tank , go full out Carrie with this look and add some statement heels . I love tulle! And I love it with the chambray! Simple shirt tucked in, for sure. And I'd definitely get the Eye Candy dress. Or maybe Jacob's Pillow. Or maybe the Gondola. SO MANY. I was thinking the same thing as some of these other ladies. The skirt has so much volume and length that I think you might look better with a fitted tank on top, tucked in of course. You might look even more like a ballerina, but hey, why not go all out? :) Let us know what you decide!! I'd get a new swimsuit with the giftcard! LOVE the skirt! So pretty & I great for engagement photos, but I think the proportions feel a bit off. The chambray is a great way to make the skirt feel more casual but I think it could be improved by tucking it in. Also maybe hair up. Have fun with the photos!! I love this skirt! I think you can wear it with a bunch of different tops. I think because it's so voluminous, you should wear fitted, tight tops on top! Awesome giveaway! I would DEFINITELY put that $50 towards that skirt you've got on!! So cute!!! I think it could totally work with a basic tee! The skirt (and you!) deserve to stand out, so I think simple is better in this case. You'll look gorgeous, I'm sure! what about something of this sort? You need something more fitted! I'd absolutely get the Elizabeth Islands dress! I am in LOVE with with Tutti Frutti skirt! So fun and colorful!! Thank you for the giveaway! I think you need something more body conscious! Maybe a black scoop neck 3/4 sleeve fitted t shirt or leotard? You have some savvy (and helpful) readers! I agree with all of them - definitely fitted and a touch more casual (tee or tank) on top. love the skirt and the shoes!! I would get the lemon drop skirt! So cute! 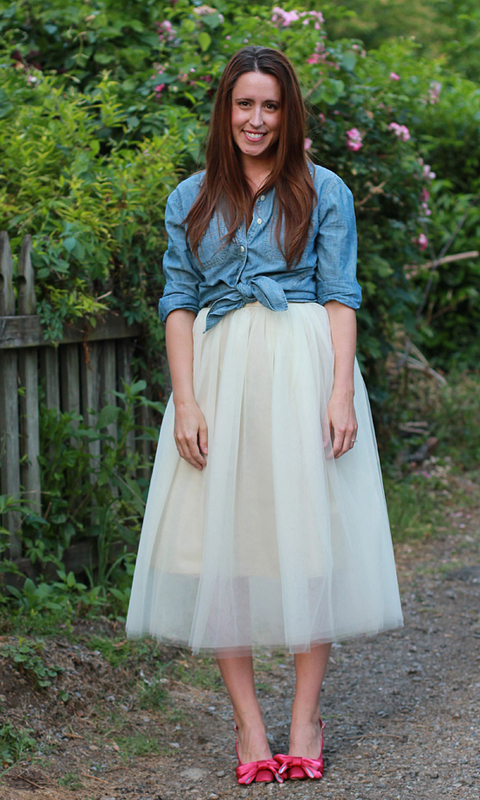 Also, i love how you styled this tulle skirt, so cute! I want a new swimsuit! I agree with Laura K below. A more fitted shirt will flatter your figure much more. That skirt is AMAZING and I can't wait to see the photos!!! Pretty skirt! Perfect for engagement pictures! Definitely fitted up top and a sleeker heel. The chiffon is poofy enough by itself. The skirt is super cute though! I love any of Shabby Apple's skirts! I'd get the Full Steam Ahead dress! I'd love to get the COCONUT CREME JACKET! I'm obviously late for this Friday 5:30 call time, but honestly I think you look divine! It is SO Carrie. 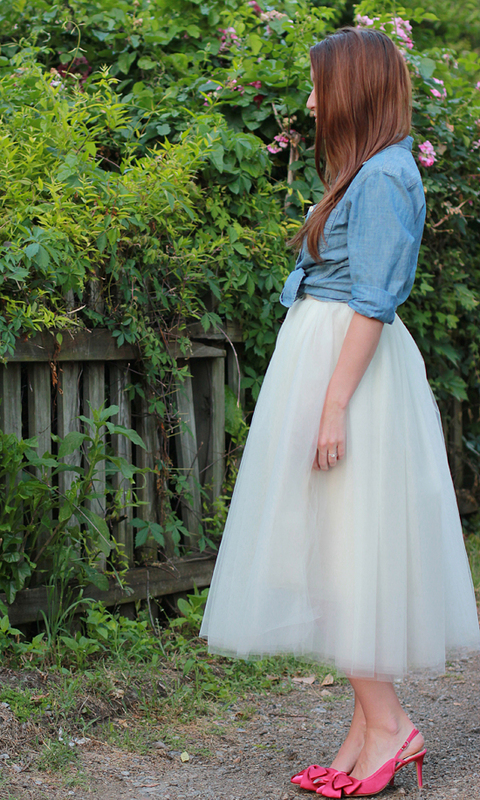 I like the juxtaposition of the super dressy tutu & heels with the more casual chambray! I recently bought a similar tutu and was planning on wearing it just this way! Another option would be a classic tee (maybe black or gray?) or even a graphic tee, if the graphic on the front was engagement photo-appropriate, with a big statement necklace? it always so hard to choose favorites at shabby apple! right now, i really like the cider dress. I love the Pop Mode dress! bummer, i dont have instagram...can i still enter? So hard to choose! I really like the True Love skirt...I wouldn't have considered it before, but your look has inspired me...thank you! I love the Bouquet dress! Yes, Shabby Apple ships internationally! I have been eyeing that tuelle skirt for months!! Love it. I like the Martha's Vineyard dress. Thank you for the amazing giveaway!! i LOVE the Alice dress!! !